Savory, cheesy, yummy goodness all piled up on a flavorful flatbread. 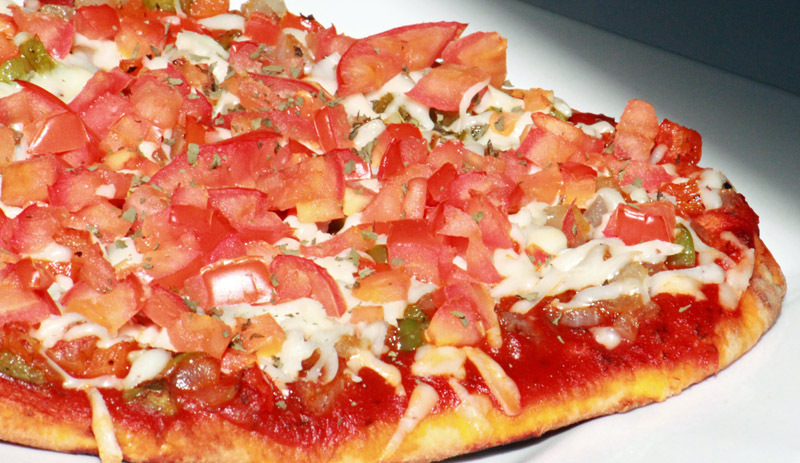 If you love pizza - and who doesn't, then you're going to love this one! You can use a commercial flatbread, but if you prefer to make your own, you can do that as well. Follow the link below for No-Rise Oven Baked Flatbread! In a large skillet, heat oil over medium-high heat. Add onion, peppers, and half of the salt and pepper to the skillet. Sauté, occasionally stirring just until onion is translucent, and peppers are fork tender. Remove skillet from heat and set aside. Place the flatbread on a sheet pan. Spread 1/4 cup of pizza sauce evenly over each piece of flatbread. Divide the onions and peppers in half and spread an even layer over each pizza. Divide the cheese and follow with an even layer over each one. In a small bowl combine the tomatoes, basil, salt, and pepper. Stir to combine and add a final layer to your flatbread. Bake at 400° for 10 minutes, or until the cheese has melted and the flatbread is brown and crispy on the bottom. Cut each flatbread into as many pieces as you like, and enjoy. Have fun making your pizza! Get everyone involved and experiment with lots of other toppings such as mushrooms, black olives, zucchini, broccoli, vegan meats, pineapple, and more!